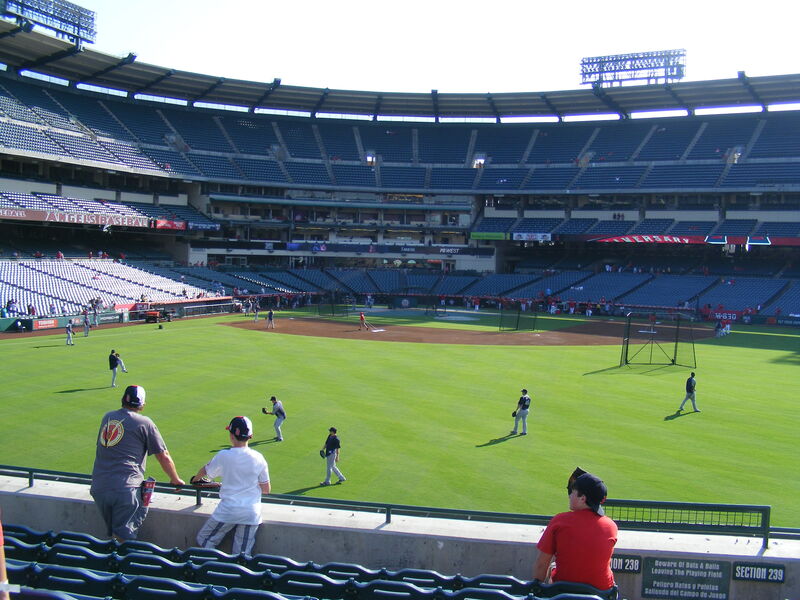 I was back at the Big A for a mid-week game against the Twins. 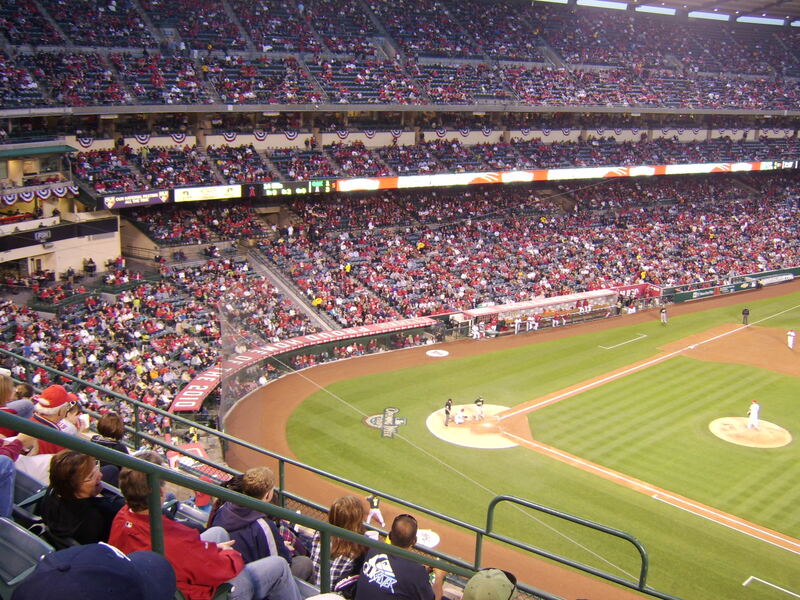 I always love to watch the Angels play the Twins because they’re very similar teams year in and year out. 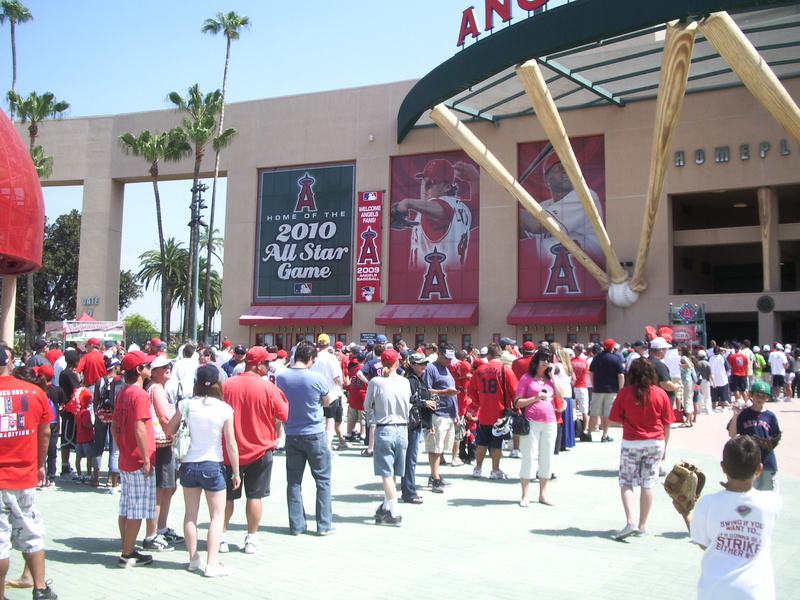 I arrived at about 4:30 and waited for the gates to open at 5:00. Michelle would be meeting me when she got out of work so I spent the time talking with a few of the BP regulars (like Chris and Rob). It was a fairly good crowd once we all ran inside and I headed up to the pavilion, as both teams would be taking a lot of hacks from the left side of the plate since two righties, Joel Piniero and Scott Baker, would be facing off. That’s Rob in the white, sleeveless shirt on the right of the above photo. I felt good about that jumping catch (and later a couple of people commented on what a good catch it was). 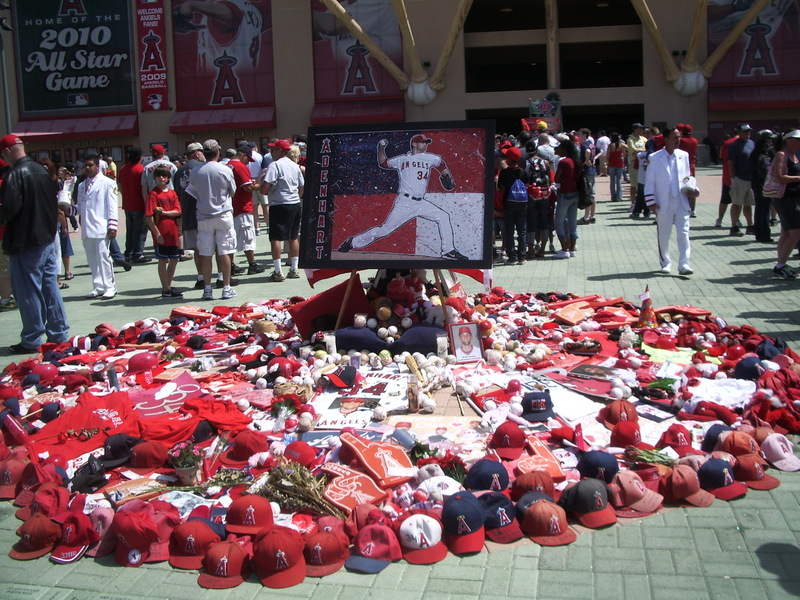 But one guy didn’t like it–he claimed that ball was hit right to him and that it was his—he was going to catch it and, not only that, he was going to give it to his son for his ninth birthday. Whoa. One–he didn’t have a glove. Two–he had been sitting down. Three–he had a beer in his hand at the time. Really… he was so prepared to catch a 400 ft. shot going 80 mph. If he had presented his concern/plan in a calm and polite way I would have probably given him (or his son) a baseball. Instead, he was belligerent and said things like, “Yeah, you better walk away,” as I went to put the ball in my backpack. A minute later, now that I was another full section away from him, he approached me (in a pretty aggressive manner) and started cursing and berating me. Not a good example to set for your birthday boy, sir. The other regulars (and the ushers in that area of the stadium) all know me and know I play by the rules. If I’d thought I had done anything wrong (or they had suggested that I had truly not made a wise decision in making such a great catch that happened to be in front of that guy) I would have given the ball right over. But, barring that–there was no way I was going to reward his crass behavior… what a lesson for his son, huh? If you cuss and yell at people, that’s how you get things you want! 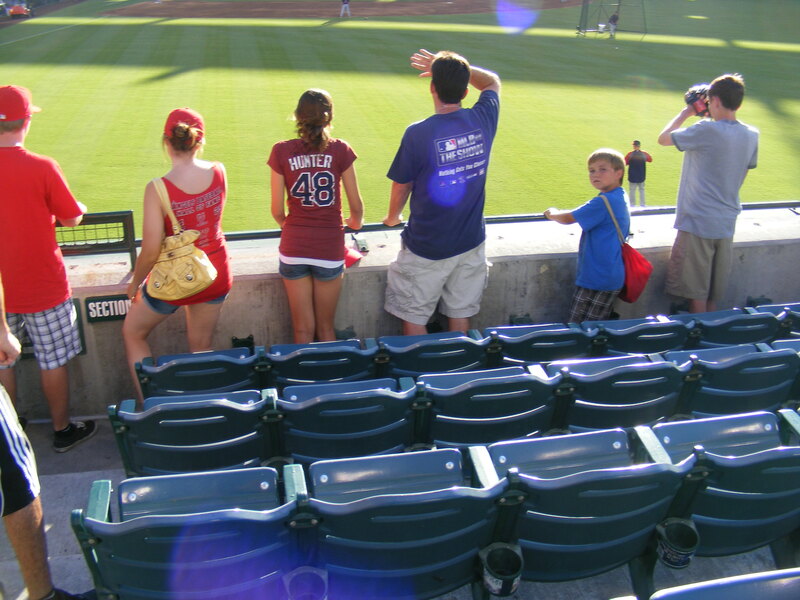 And that kid in the blue shirt looking at the camera is Chris’ girlfriend’s little brother, Brandon. He’s on his way to catching a ton of baseballs himself–I’m pretty sure he caught at least two at this game. 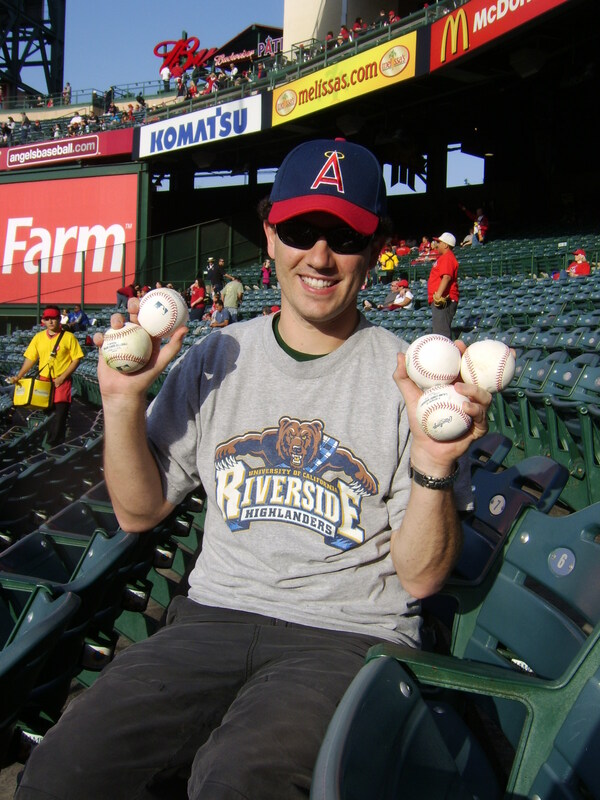 I ended up with three baseballs–all hit–two of ’em caught on the fly. 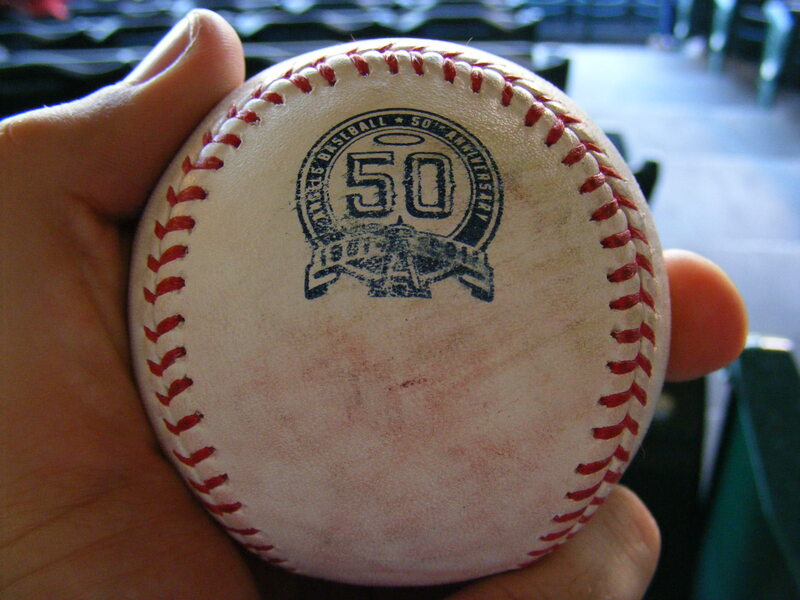 And one was a 50th Anniversary commemorative baseball. Not a bad batting practice session. I ran to the Twins’ dugout after BP but didn’t get anything there… nor did I get a ball from either team during their warmups before the first pitch, try as I might. 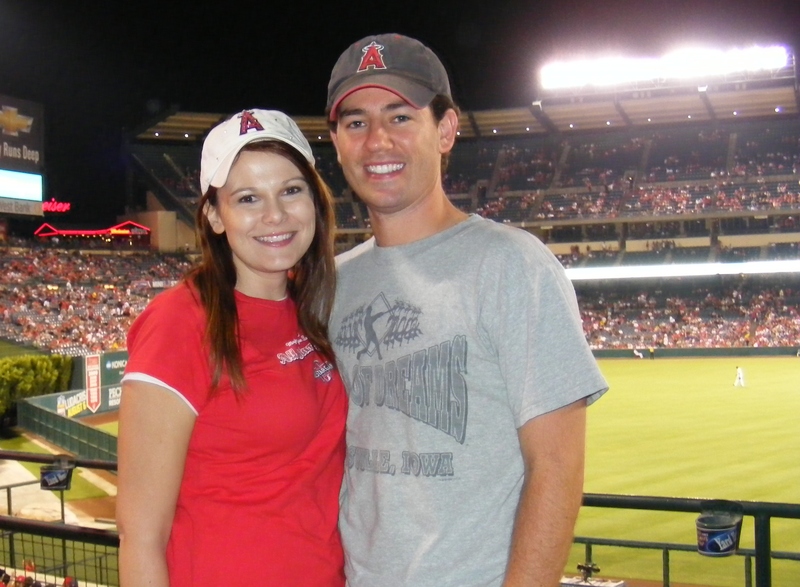 Michelle and I watched the game from out there and, though I tried for a third out toss at the Angels dugout a couple of times, I was content to just hang out with her and enjoy the summer evening. Rob! Nice snag on the fly, dude! It didn’t happen and the game went final. The Twins tossed a couple baseballs up after the game but nothing came my way. Still–a fun night at the stadium. It was a warm summer evening in Orange County and I was psyched about hats. 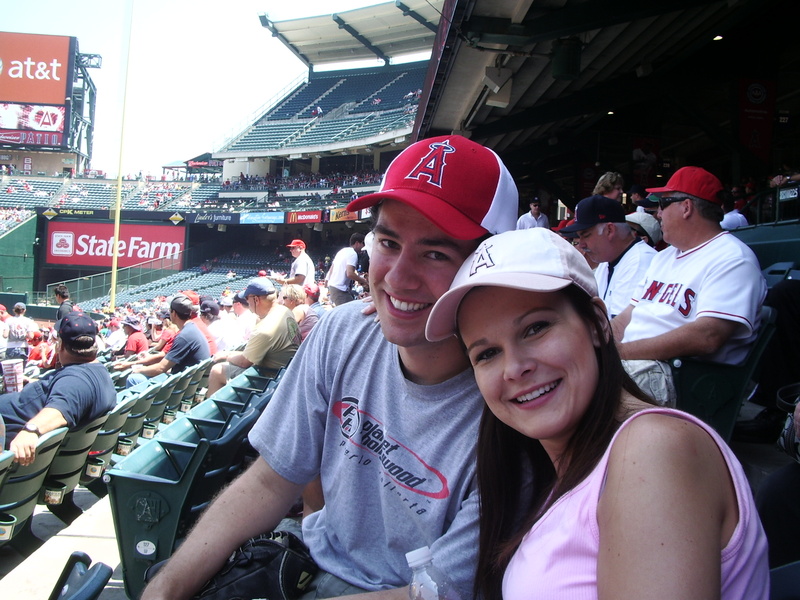 Not just any hat, however… no, I was psyched about the Angels Flashback Hat promotion at Angel Stadium. 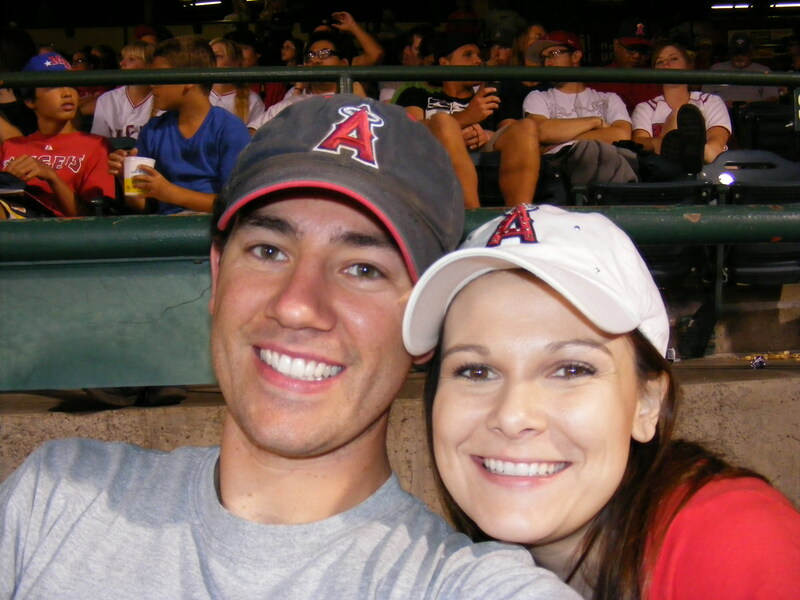 I’m usually not too excited about a stadium giveaway (SGA) but I actually really liked the hat I’d seen on the Angels’ promotions page. 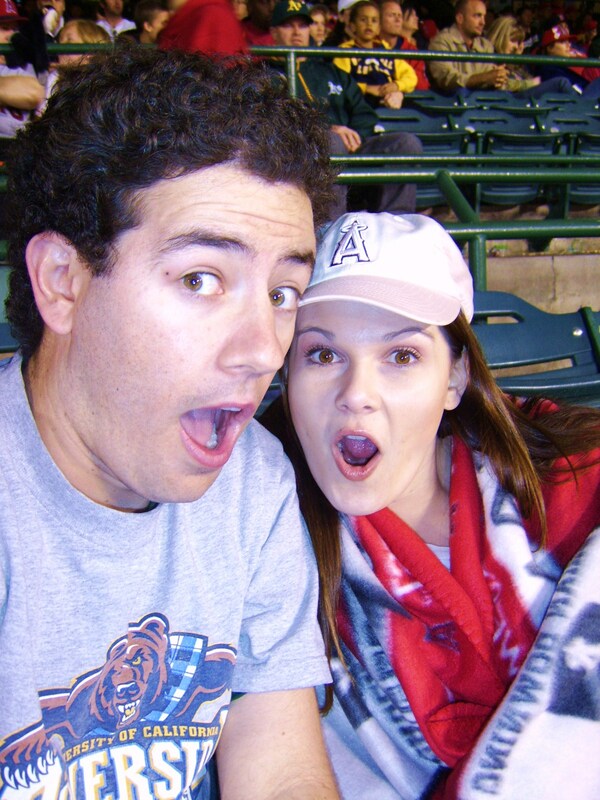 I’d been planning to go to this game for about a month and a half along with Michelle. Cool hat giveaway, plus I love watching the Seattle Mariners play–they’re fun to watch (and have quite a few powerful–in BP–lefties this year). I grabbed a spot in line near Devon, and headed inside. I nabbed my first free hat and ran out toward the right field seats. I’m guessing that it must have hit some concrete and then gotten back into the bucket somehow. Like it bounced off a seat or two. 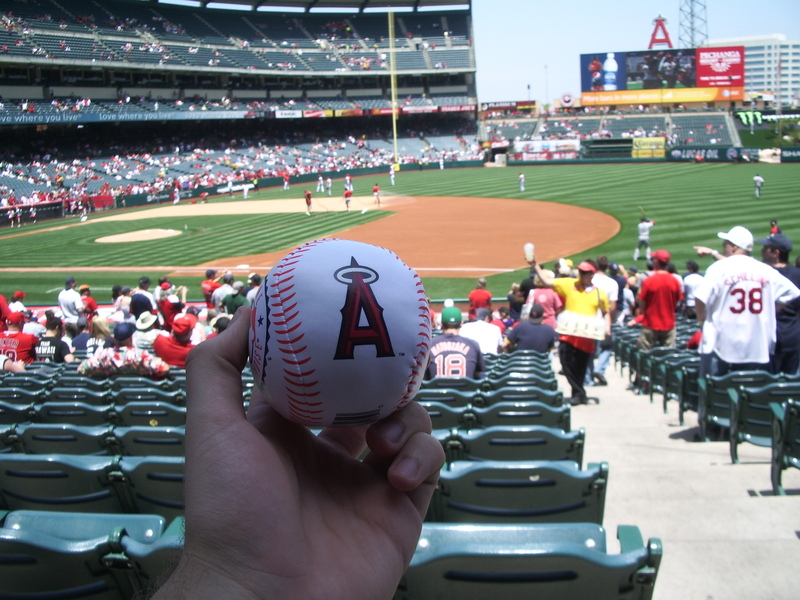 That would be the only ball I’d get from the Angels. Hisanori Takahashi threw a ball up after I asked him in Japanese… but he threw the ball to an Asian fan on my right… I think he was confused as to who asked in Japanese for the ball. But I wasn’t worried… I knew that Ichiro hit first in the first group of Mariners. And I knew that he hit absolute bombs during BP. It looks absolutely brand new. 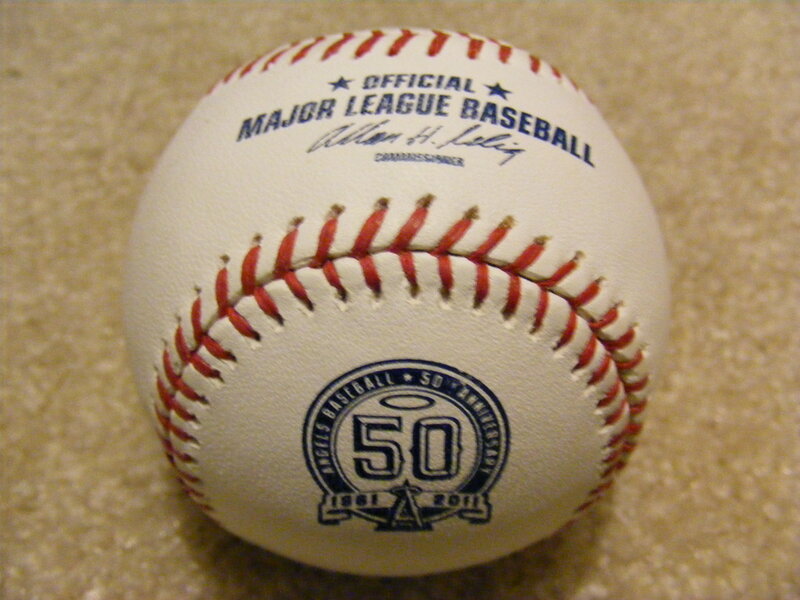 As a matter of fact, I didn’t even write a 324 over the “ings” in “Rawlings” since this was my 324th baseball snagged. I left it clean and pure, like the baseballs being sold for $24.99 in the Team Store. Things slowed down a bit after that and I kept just barely missing out on some of the shots the lefties were puttin’ in the seats. 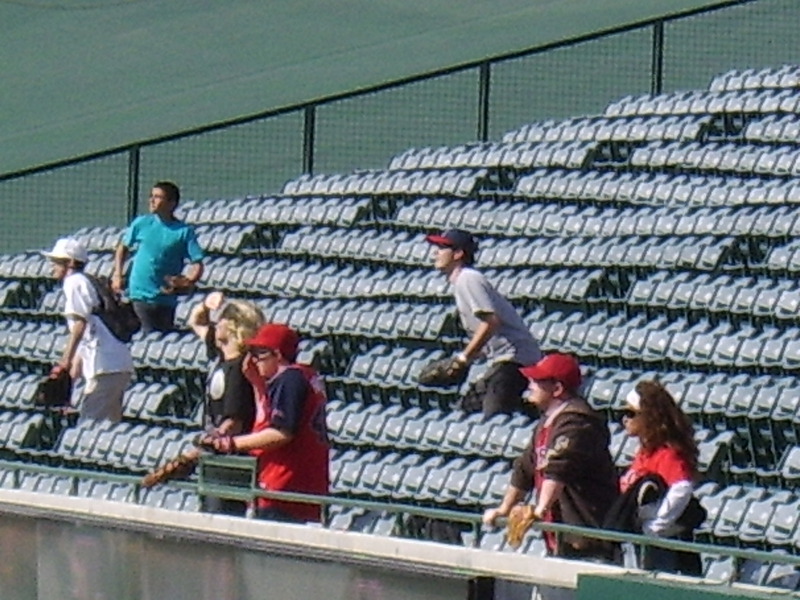 Rob made a catch on a ball in the row in front of me at one point. My glove was right behind his. I had it positioned, the ball was descending, and at the last possible second his glove rose up from under mine… he didn’t push me out of the way or deflect the ball or knock into my glove… he just got three inches in front of it. A clean play for sure. I congratulated him on the snag. Rob is, FYI, well over the 1,000 ball mark in his lifetime–and he only plays for hit baseballs which makes his quantity of baseballs snagged rather impressive, actually. Ball #4 of the day came courtesy of lefty Jason Vargas. 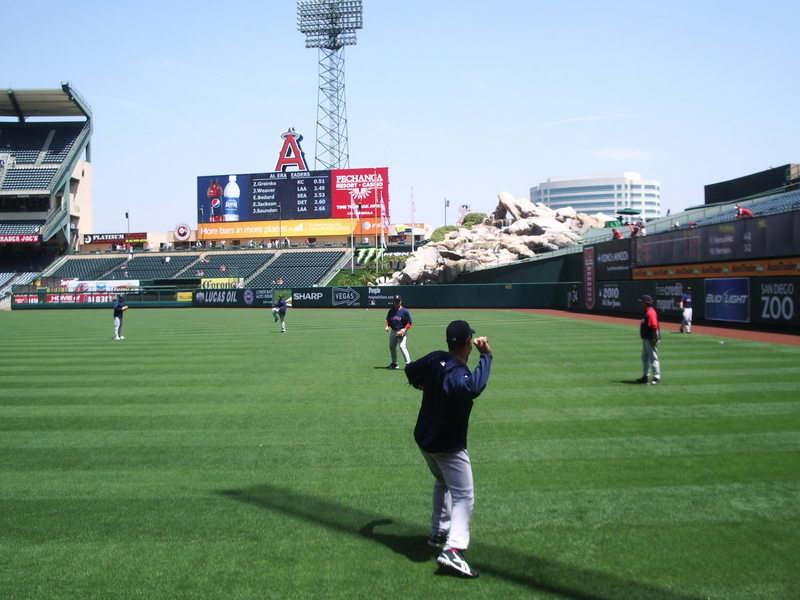 He’d been hanging out with Felix Hernandez (who has rather poor aim when tossing balls to fans during BP). After Hernandez missed me by four feet earlier in the BP session when trying to throw me a ball, Vargas scooped a ball off the warning track and tossed it right to me. 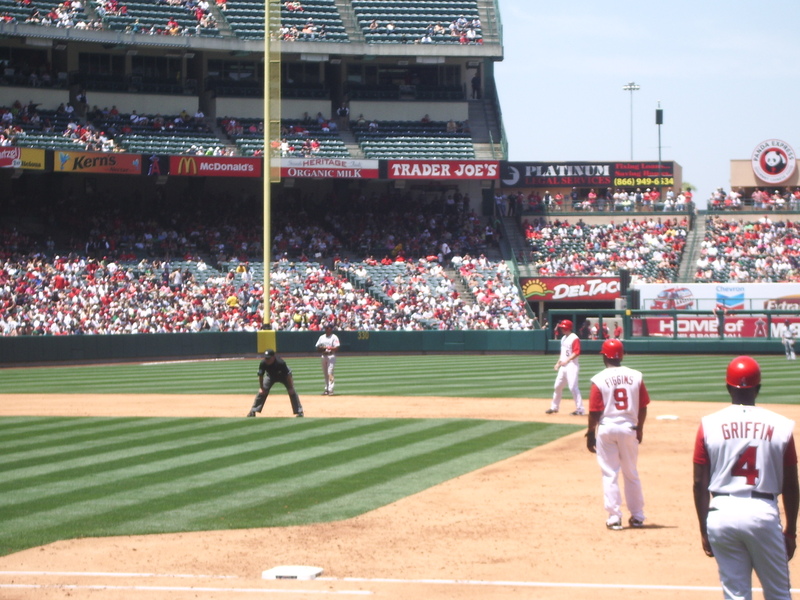 The spot of the catch is shown in the photo above and to the left. I was in the first row. And Vargas is the Mariner on the left in the photo. Interesting, huh? 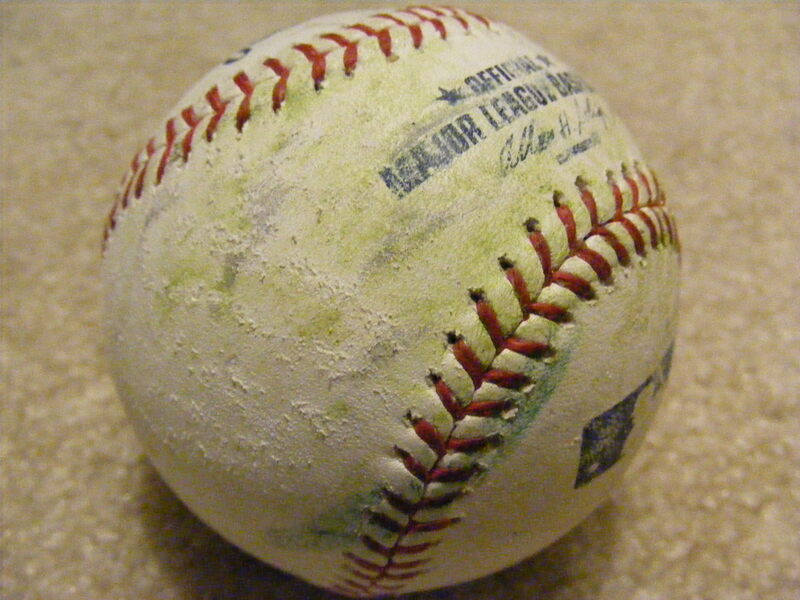 Since all Major League Baseballs are made by hand, this is bound to happen. I’m just kind of surprised that this ball hadn’t been marked as BLEM (for “blemish”) or PRACTICE. You couldn’t use it in a game, right? 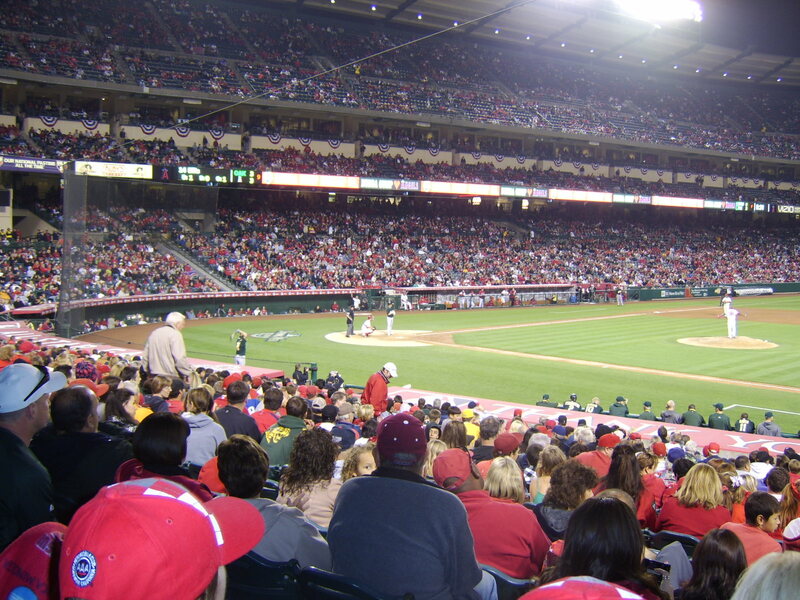 The Angels would get the W for Jered Weaver, making his final start before the All-Star Break–he’d be named the AL starter with a record of 11-4 and an ERA of 1.86 after the first half of the season! Cy Young Award, anyone? 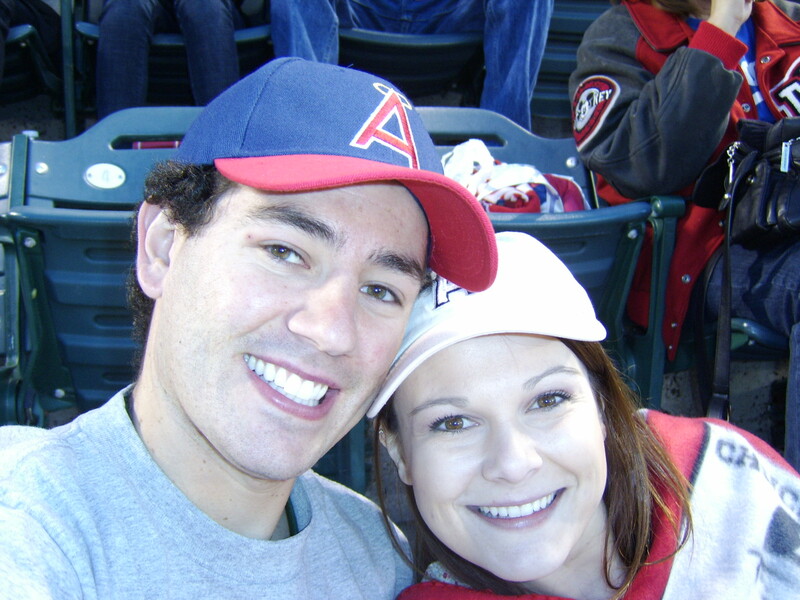 I got back from New York on Friday–and on Saturday I convinced Michelle that we should head to an Angels game. 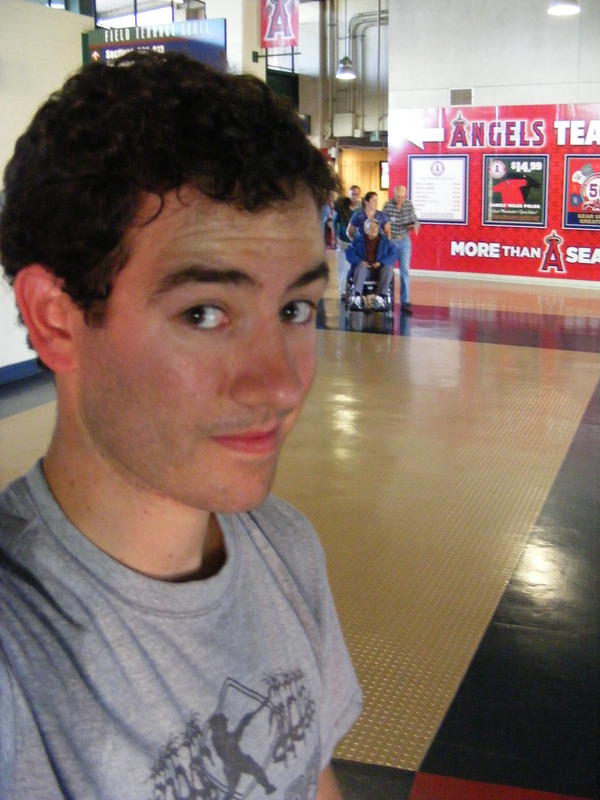 I was psyched and ready for a real game at the stadium this time (I’d already been to an exhibition nine days earlier). We didn’t have tickets in advance but we got to the ticket window near the gates at 4:40, bought two tickets, and got in line. Shortly after Michelle and I arrive I saw Chris and chatted with him about his offseason and a little while later we saw Rob and Terry. I’ve written about all these guys before, remember? 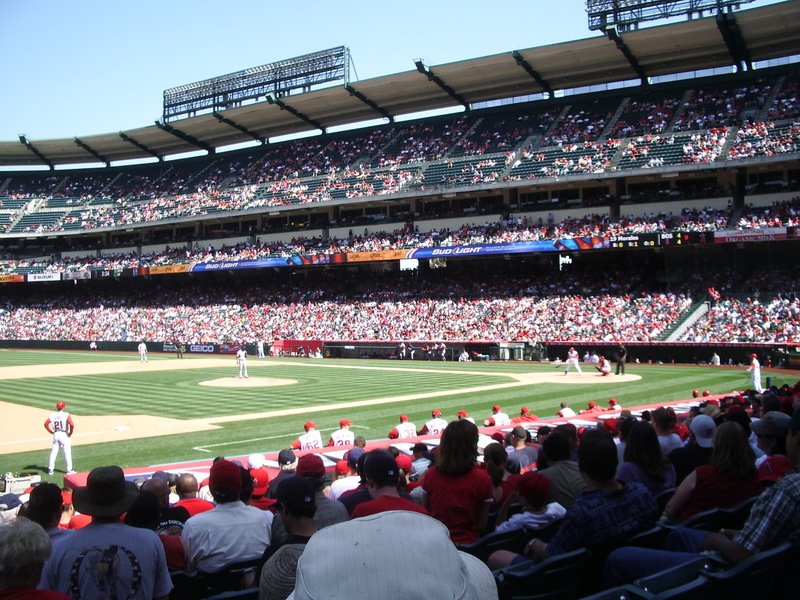 The gates opened at 5:00pm and I was off–running to the pavilion in right field. Rob was right in front of me heading up the escalator and I zoomed by him and made it out to the seats first. 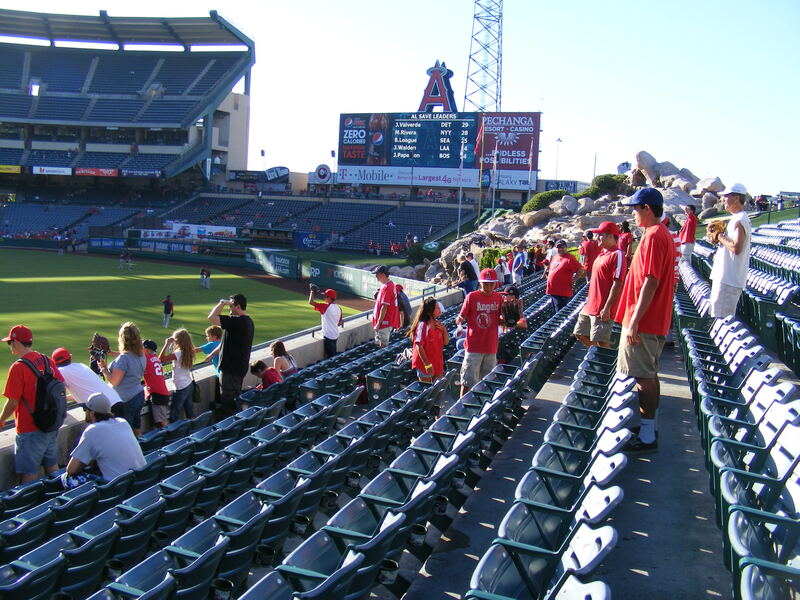 I ran down the staircase, checking each row of seats. As I got to the second row I saw a ball rolling… down into the first row. What? There are NEVER any Easter eggs in Anaheim!!! It probably had just been hit out to the seats just before I got there. 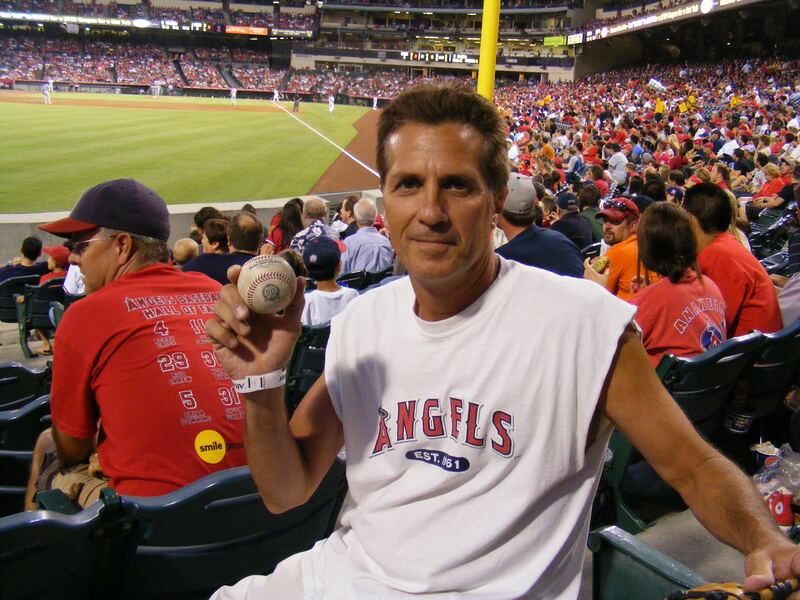 As I scooped up Ball #1 on the day (and the 161st of my life) I thought back and this was only the 2nd game at Angel Stadium in which I’d found a ball. The last time it happened was 7/27/09 and I’d found two of them! I’d forgotten my camera on this abrupt trip to the ballpark but Michelle had hers and she agreed to snap a few pictures during BP. She typically sits and reads in the shade out of the way of flying baseballs so the pictures are a little far away (or blurry) but she got some good ones. 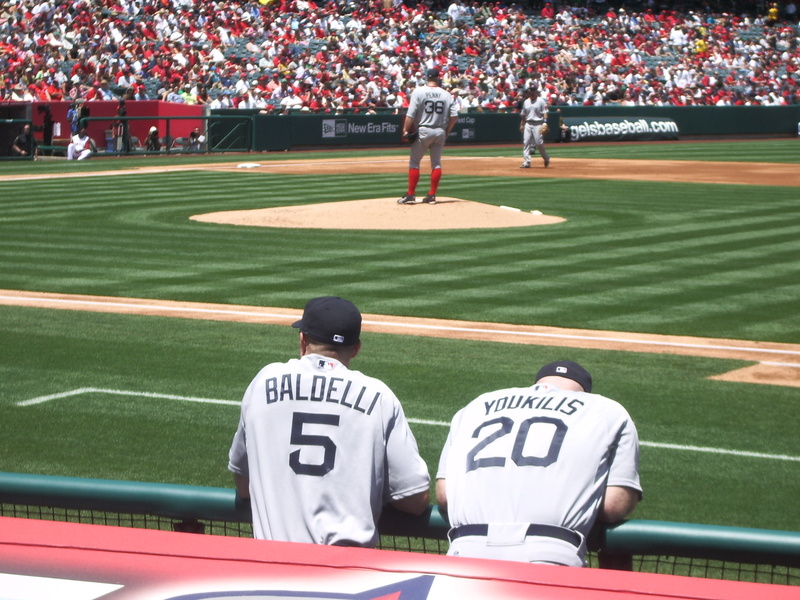 I had to wait until almost the end of the Angels’ portion of BP.to get my next ball–but it was a great moment. I’d been hanging out on a staircase in right center. Mike Napoli was swinging and I knew he had good opposite field power. He smacked one that had a chance to make it up to the pavilion. I ran a full section to my left, down the staircase to the first row and reach out over the wall just to my left. The ball hit the pocket of my glove just in front of the wall… I kind of hit the wall, too. But it was worth the bruise on my leg to make that catch. 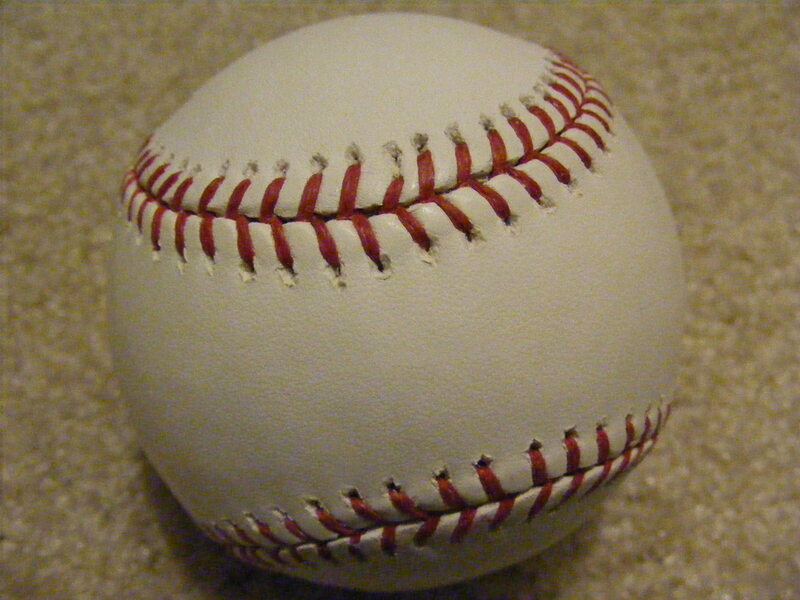 It was my first ball caught on the fly in the 2010 season. I can still catch, go figure. In the above photo you can see a red arrow (click on the pic if you need to) and it’s pointing to me. 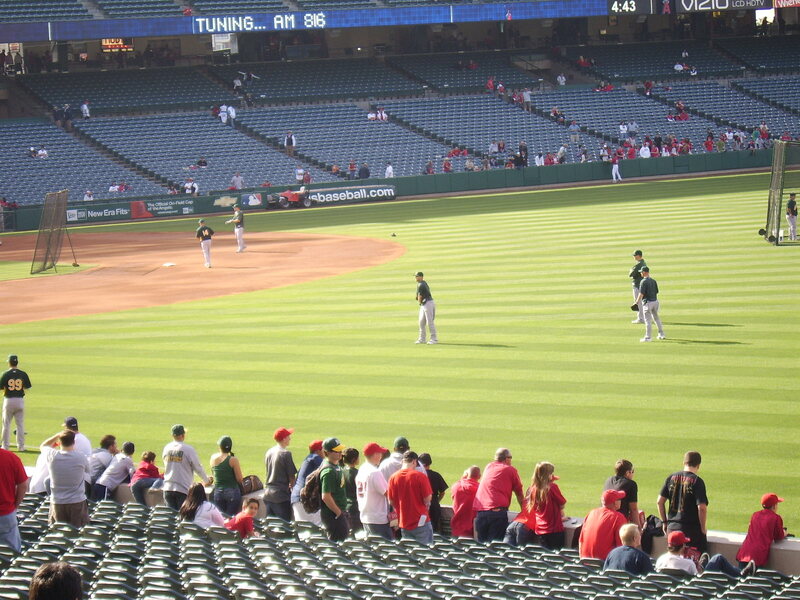 It was a pretty light BP crowd. Shortly after he finished his warmup throws, Andrew Bailey threw me Ball #4 on the day. There were a few slicers and foul balls that whizzed by but I couldn’t get a glove on any of them. And then as the A’s trotted in I sprinted to their dugout and Brad Ziegler tossed my my fifth baseball. Sweet! The only other thing I got (other than stomach pain from the gross buffalo boneless wings I ate) was one of those soft baseballs the Strike Force shoots out of an air cannon. 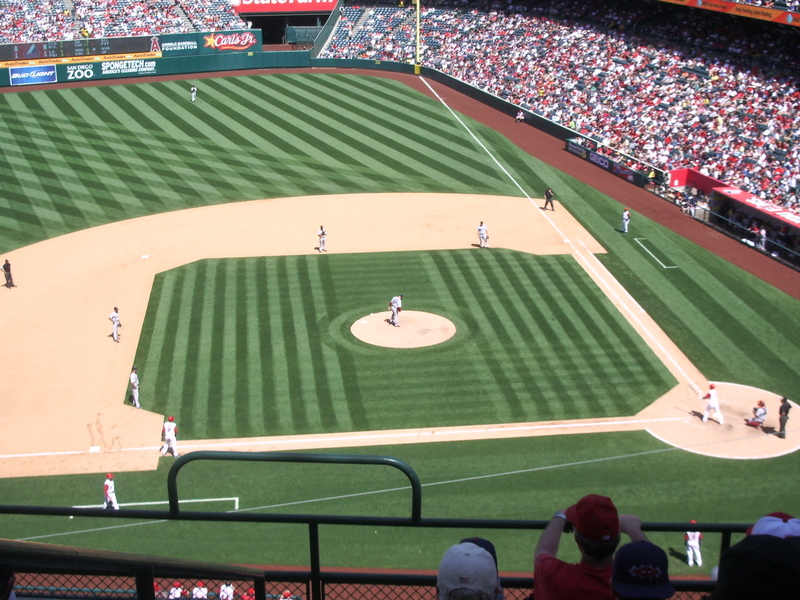 I tried for warmup tosses before the game and then tried for a third out toss in the bottom of the first… and then Michelle and I decided to find some seats in the upper level to watch the game. 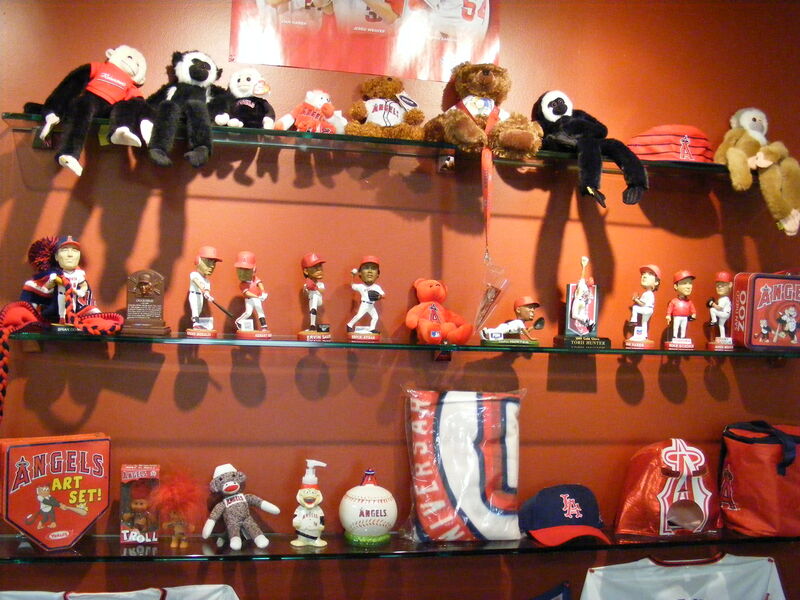 Before we went upstairs we went to check something out… I had heard that the Rally Monkey would be making an appearance at this game. And that you could have your picture taken with said monkey. 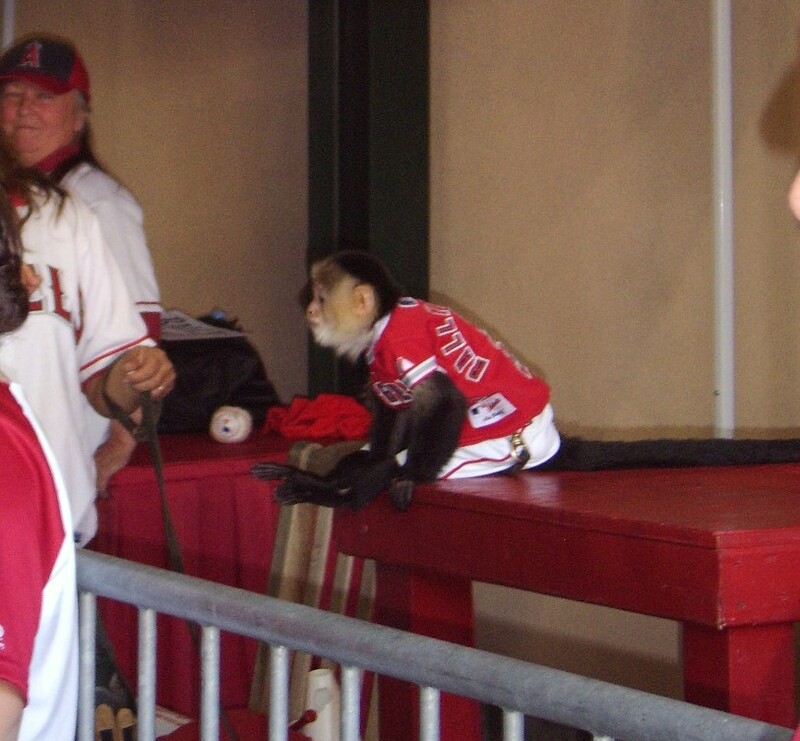 Now, I’d never seen the Rally Monkey before and I didn’t know if it would be an actual monkey or someone in a monkey suit. ttle guy, but the line was super long… so we were fine with just getting a picture of the little critter. It was a great game! It could have been better but, still, we had a lot of fun. 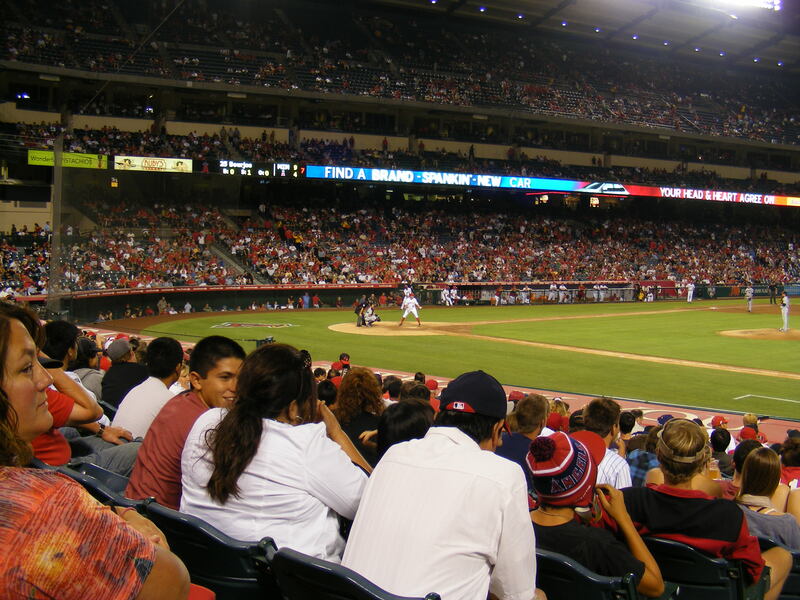 Ben Sheets pitched against Jered Weaver and Weaver gave up one run in six innings against Sheets’ three runs given up in six innings. But Weaver didn’t get the win. Erick Aybar and Jeff Mathis made base-running mistakes and Kevin Jepsen and Scot Shields each gave up a run so we went into the ninth inning tied at 3-3. Fernando Rodney would throw a shutdown ninth. Bobby Abreu doubled with one out in the ninth… and then Torii Hunter was intentionally walked by Craig Breslow to get the lefty-lefty matchup against Hideki Matsui. Well, Matsui laced a double just fair down the right field line to score Abreu and the place went nuts! 4-3 Angels. It was a good time–and we headed out to the parking lot with smiles on our faces. On the way out I gave away two of the baseballs I’d snagged (and I had already given one away to my favorite usher during the game). I’m basically giving away most of the balls I snag this season unless their special/commemorative… I’ll run out of storage space eventually anyway. So, I’m making tons of kids (and parents) happy. 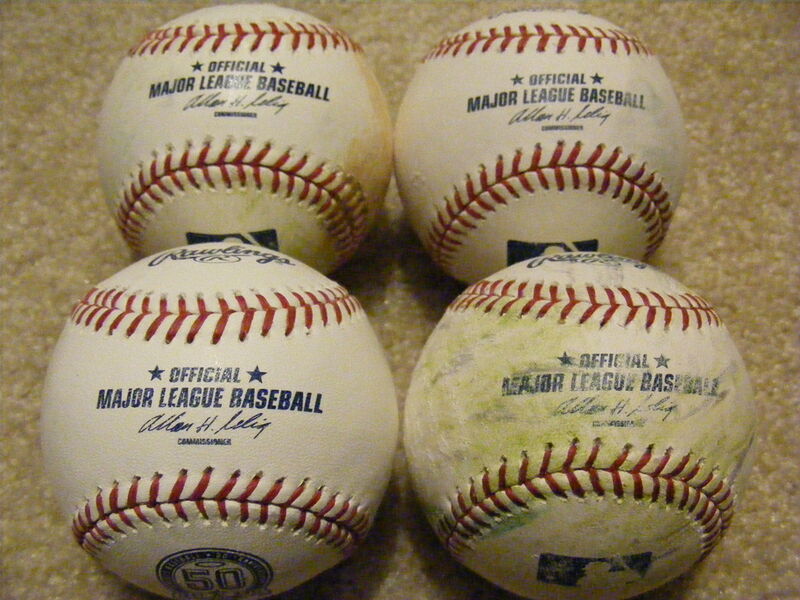 Heck, I’ve snagged twelve baseballs and given away more than half of them to ushers and kids already. Ah… it’s nice to have baseball back again! thursday day game. 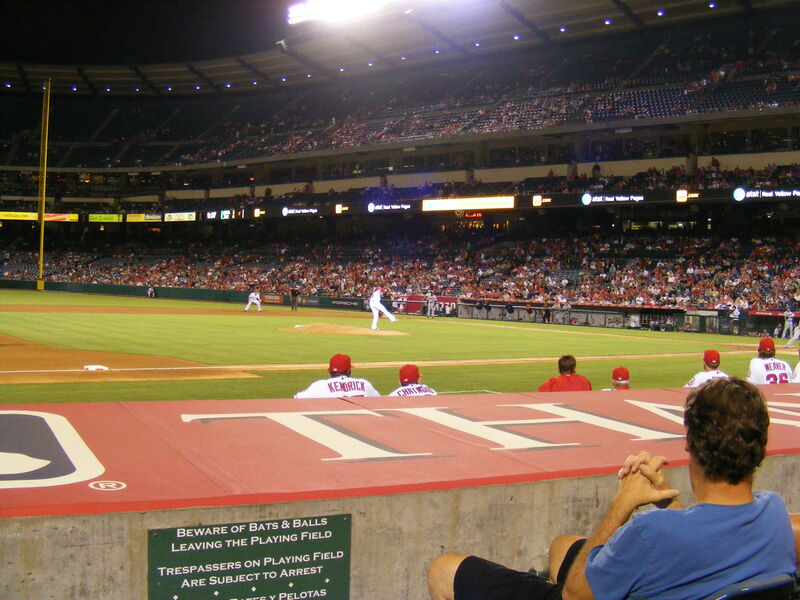 angels-red sox. may 14th. 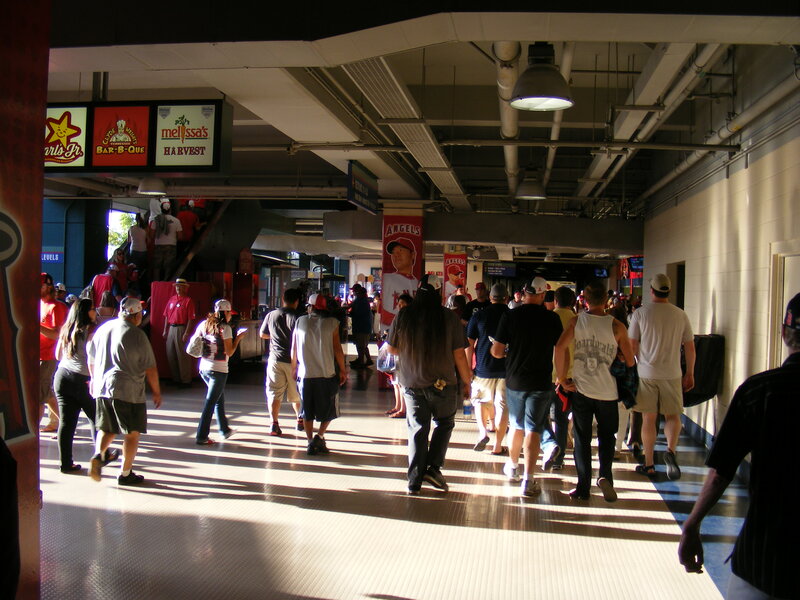 Lots of fans, late opening time, day game after a night game… I was worried I’d be unable to walk away with a baseball. Dang… I called Michelle and said, “No batting practice today. 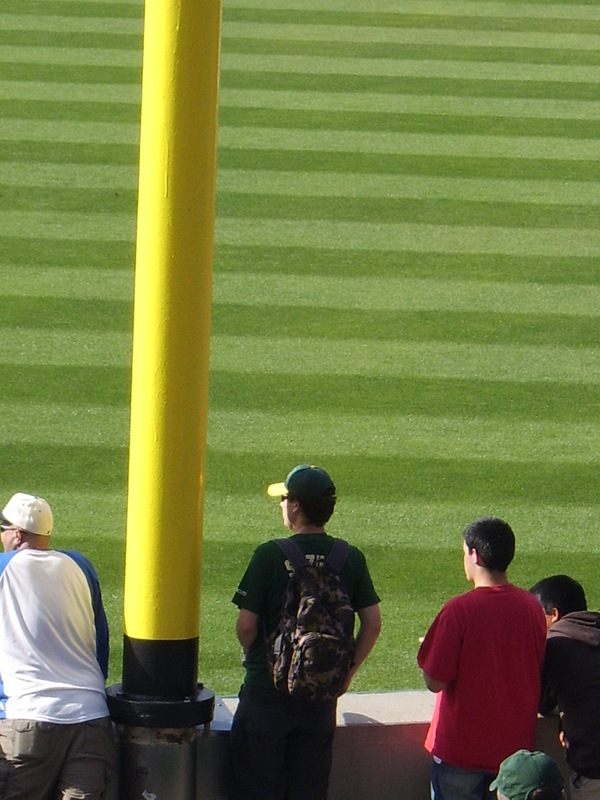 I’ll be near the foul pole.” And that’s where I was a few minutes later when they arrived. Nothing was happening on the field. I knew the players would come out to stretch and throw eventually so I stayed put. 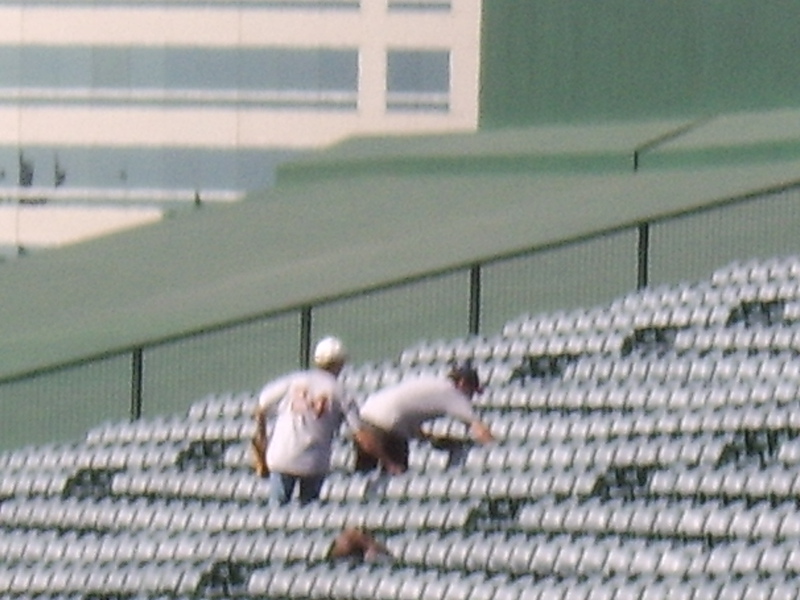 Sure enough, some Red Sox pitchers soon trotted out and after some basic warmups they started throwing. There were a bunch of Red Sox fans all along the wall. I watched Tim Wakefield throw a few knuckleballs and then tried asking Takashi Saito for a ball in Japanese (like I did last September at PETCO Park) but I only managed to get a smile out of him, not a ball. Jonathan Papelbon started signing closer to the infield so I headed over there and, with the help of a Sox fan in front of me, got his autograph on my ticket stub for that day. 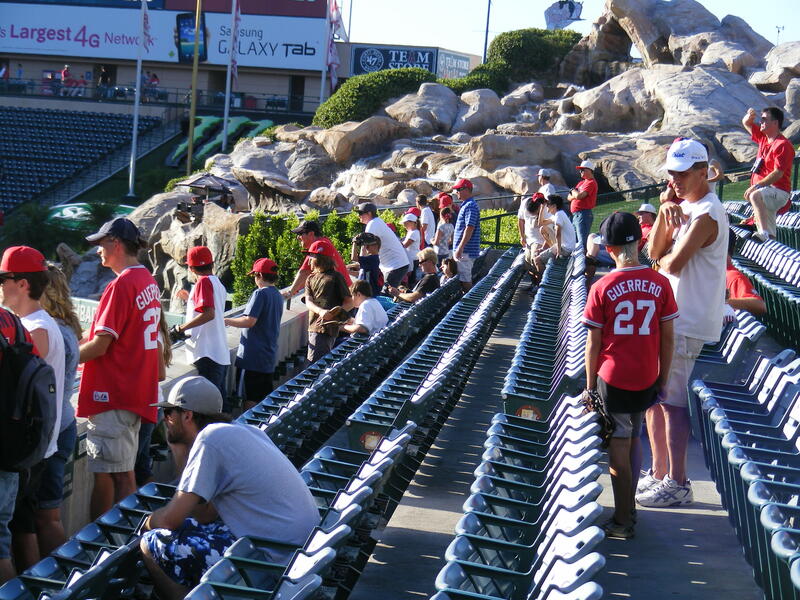 He progressed out toward the outfield, signing for virtually everybody, and I stuck where I was because Hideki Okajima was finishing up his pregame throwing. He wrapped up and I asked, in Japanese (thanks, Zack Hample) for the ball. He turned, confused as to where the request came from and I put my glove up, repeated my call from the third row of the stands and he saw me! 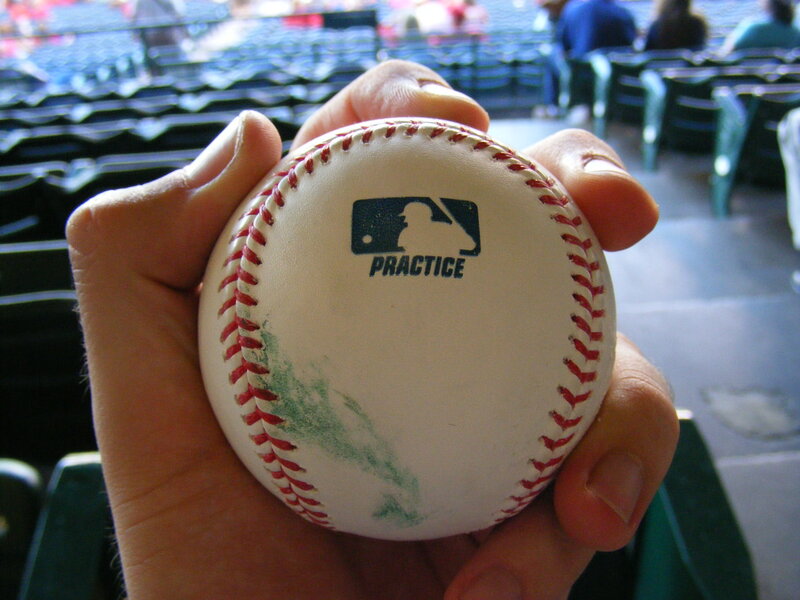 He tossed it right to me–perfect throw! I was so psyched! That’s the first time I’d ever successfully gotten a ball from a player by asking in a non-English language. This would be a day of firsts for me at the ballpark, actually. 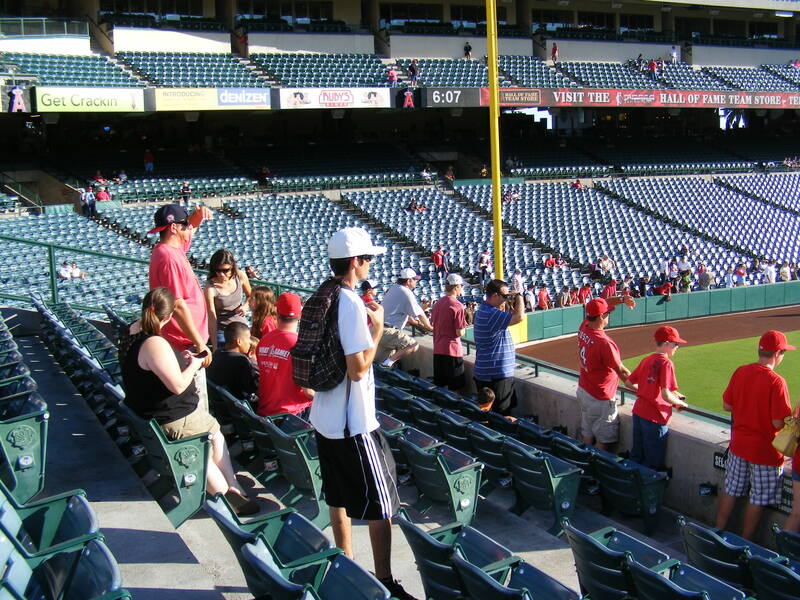 Now, I wasn’t shut out… whew – but I didn’t snag any other actual baseballs during pregame stuff… I did, however, snag an Angels Softee Ball from the Strike Force as they shot off their air cannons just before the game. My first time snagging one of these, too! 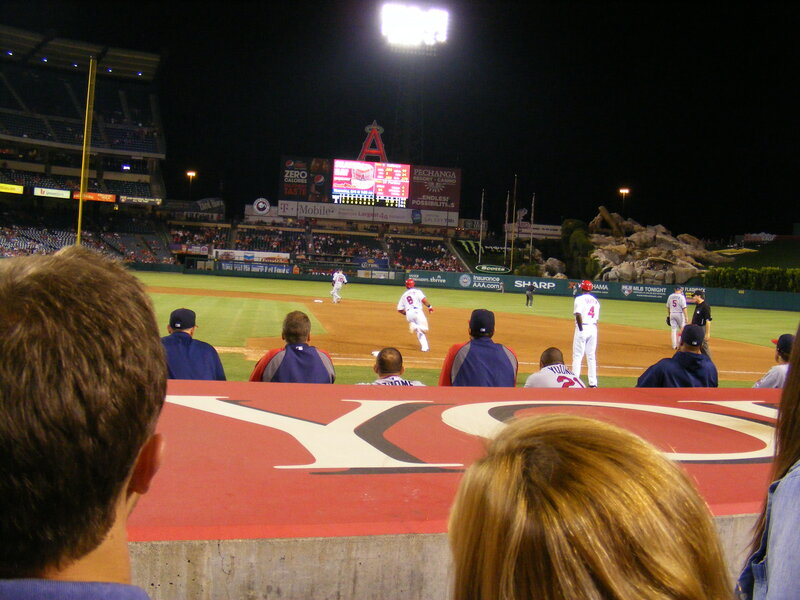 We found seats on the first base side and were able to stay there for the first third of the game (see some shots below). 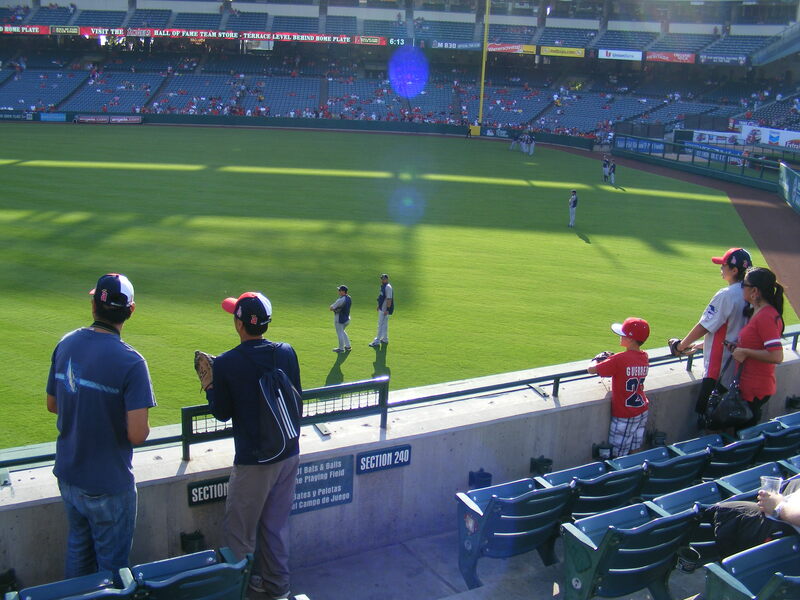 I tried to get a ball from the infielders playing catch before the game and from any players that had recorded third outs as they headed into the dugout. Nope–just wasn’t happening on this day. The souvenirs kept going to the section to the left or right of me. You know what’s awesome? Free baseball! 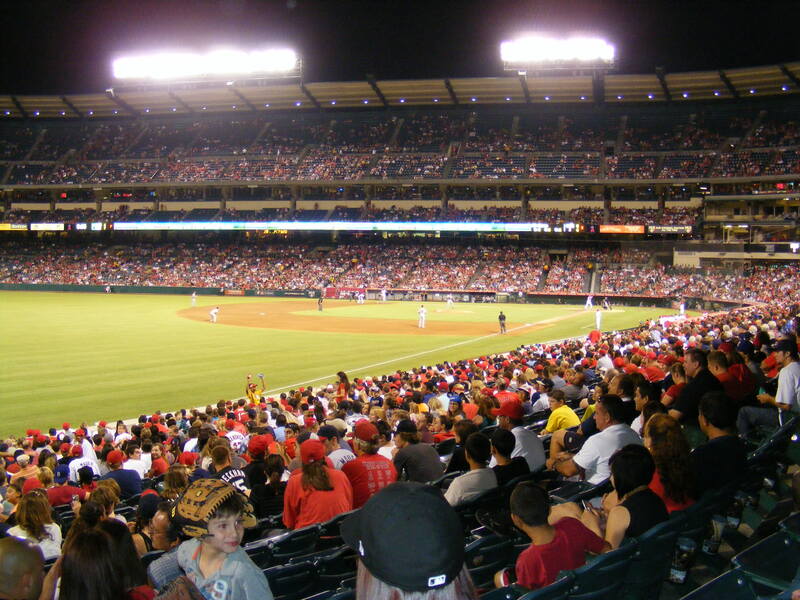 The Angels and Red Sox were still tied at the end of the ninth so the game headed into extras. I’ve got to say that this ended up being one of the best ballgames I’ve watched in person in a long, long, long time. Each team had chances to score. The Red Sox would end up leaving a total of thirty-four men on base, twelve of those by Ortiz (who went 0 for 7). It was thrilling… I mean, this game had triples, double plays, stolen bases, hit batters, lots of strikeouts, arguments between managers and umps, and twelve innings! Oddly enough, no home runs… whatever. Still, so exciting! In the bottom of the twelfth, Juan Rivera hit a clean single. Reggie Willits (who I am a big fan of) pinch ran for him. Erick Aybar sac bunted him to second base and then Jeff Mathis came up, knocked a line drive into left-center and that was the game! 5-4 Angels! Man, it was great! Did I mention that this walk-off win for the Halos occurred after they escaped a Big-Papi-at-the-plate-with-the-bases-full situation (shown above)? And Torii Hunter stole Dustin Pedroia’s (potential) 5th hit of the day from him with a great catch in center? Both Pedroia and Hunter are studs and I really respect how hard they play the game. Awesome! 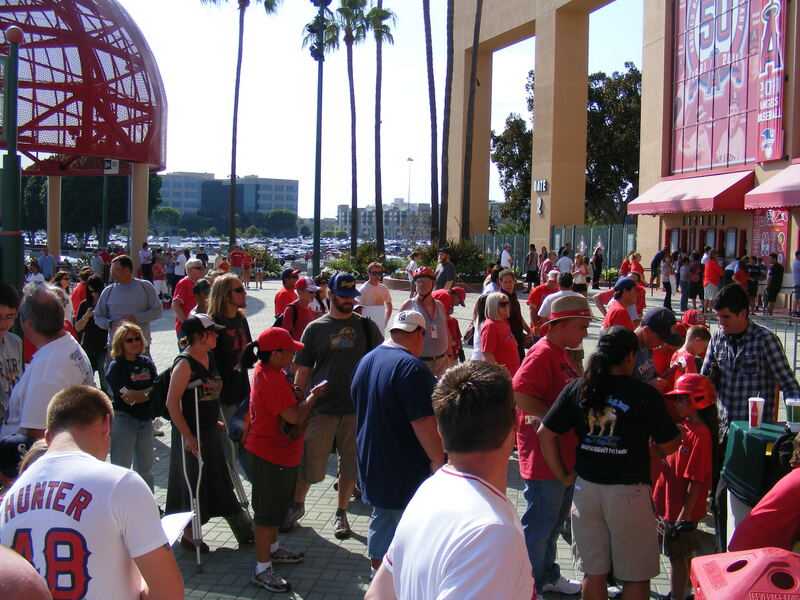 Really, the teams fought each other hard the whole way and most of the 35,124 fans there stayed to see the end… a miracle in SoCal, I’ve noticed. And though I didn’t snap a photo of it… I was on the Jumbotron for the first time ever! I just happened to be standing up during a pitching change and Dennis said, “Matt!” and the guy on the other side of me said, “Hey, is that you?” and he pointed to the screen. Sure enough, it was me… I gave a nice thumbs up and looked straight into the camera before they cut to someone else. That was pretty cool. All in all, a fun, successful, super-fastasmawesome day at the park!